Our general style of food is Thai because our its our favourite type. The inspiration of all our dishes is based from what we like. 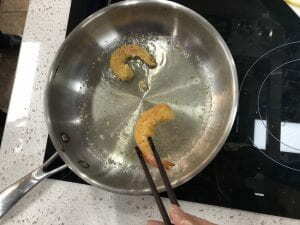 For appetiser, we made coconut shrimp. The ingredients are shrimp, egg, bread crumbs, flour, salt, pepper, coconut shreds, and vegetable oil. For the plating, we used avocado, carrots, onion, mustard seeds, lettuce, and bell pepper. First, we dip the rinse the shrimps with cold water. 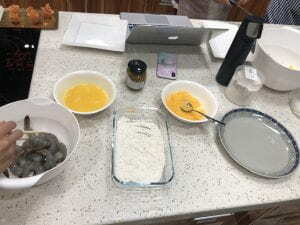 Next, we peel off the shrimp’s shell and dip it in egg, flour with salt and pepper, then a mixture of bread crumbs with coconut shreds. Then, we fried the coconut shrimp in vegetable oil. 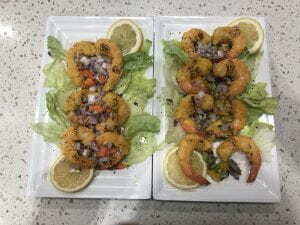 Lastly, we arranged the coconut shrimp and plating. Some troubles we faced was that the some of the shrimp were undercooked. We originally planned to give everyone a shrimp, but since it was undercooked, we had to give people half of a whole shrimp. In conclusion, this was our most successful dish because the taste and visuals was on point. For main, we made pad thai. The ingredients are pho noodles, oyster sauce, vinegar, dried sour plum, corn starch, onion, salt, pepper, garlic, carrots, and egg. 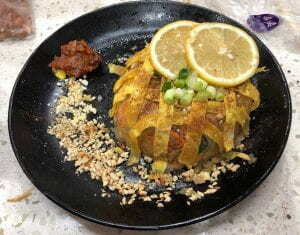 For the plating, we used dried sour plum, crushed peanuts, and nutmeg. 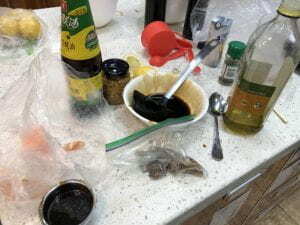 First, we made sauce with oyster sauce and vinegar. Next, we made the pho noodles boiled. Then, we fried the vegetables and eggs. After, we fired the noodles, sauce, eggs, and vegetables together. Lastly, we arranged the pho noodles and plating. We met a lot of troubles during this round. The pho noodles were to gooey because of the eggs, we tried to fix it by adding corn starch, but it didn’t work. In the end, we ended up with noodles that looked like fried rice. Because it was gooey, we couldn’t make it pretty, since it didn’t hold its place. Overall, this was a failure because the visual and taste was not great. For dessert, we made mango sticky rice. 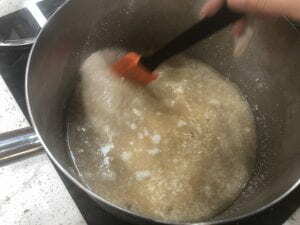 The ingredients are thai glutinous rice, brown sugar, and water. 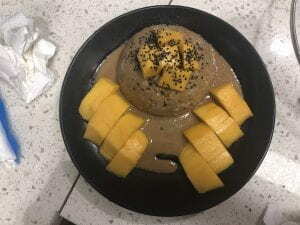 For the plating, we used sesame seeds and mango. 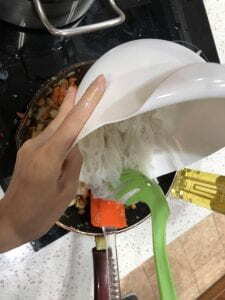 First, we soaked the thai rice with water for 25 minutes. Then, we simmered it with brown sugar and coconut milk for 25 minutes. 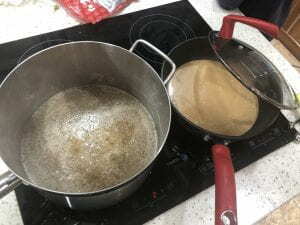 During the period of waiting we made the sauce(brown sugar and coconut milk.) Lastly, we cut out the mangos and plated the rice and sauce. Some things that didn’t work out was the color and rice. We assumed that the color of the rice and sauce was going to be white, but it turned out to be brown because of the recipe’s brown sugar. The sticky rice was supposed to be sticky, not gooey; however, ours was not sticky, but gooey. The taste of the mango sticky rice was delicious, but the visuals were not up to the standard. If we were to make it again, we would change to a new recipe that has less water and brown sugar. My biggest success was making the hangers. Though it is not the most eye-pleasing part of my catch, but I learned a lot through making it, it really made me think outside the box. At first, I was going to hammer regular nails in, to make a hanger that does not have curves. That idea was really basic and would be hard to hang things on. After thinking about the cons, I decided to hammer screw-eye hooks in. That would be a great idea because it had curves, it was basically a hook. Through this process, I learned to think to think creatively, and think about the pros and cons of ideas. My biggest obstacle was painting. Because of limited supplies and time, I was not able to finish my project. My plan was to paint and carve small, intricate details with various colours into the wood. After considering the time, I had to change a plan. In the end, I stuck with the basic, aesthetic white cover. If I had more time, I would have done my original plan. Overall, I think this catchall was successful because it functions as a catchall. It can store and organise things very easily. My catchall has various forms of organisation. For instance, hooks for lanyards, desk for phone, and cups for pencils. My catchall was also very appealing. The white cover gives it a clean, pure look, which makes you feel very organised. In conclusion, I am very satisfied with the end result. 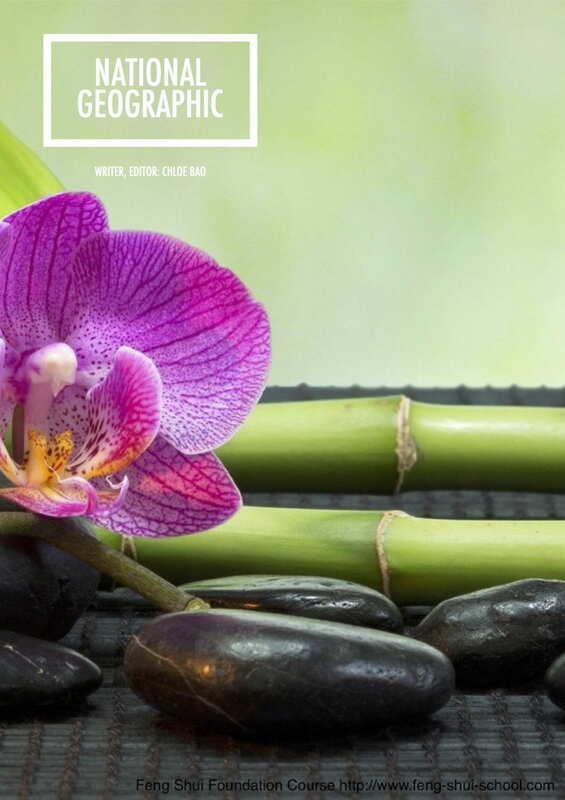 An article that will explain what is the ancient China civilization, what is Feng Shui, and why Feng Shui is historically significant. This poem is about my life, memories, and where I am from. I hope you enjoy it! “Don’t judge man until you’ve walked two moons in his moccasins.” – Walk Two Moons. Salamanca Tree Hiddle’s (Sal) parents got divorced, her dad found a new girlfriend but Sal doesn’t like her. Sal’s mom is in Lewiston, Idaho relaxing. Sal’s mom’s birthday is almost here, so she went on a road trip with her grandparents to Lewiston. During the road trip Sal tells the story of Phoebe, in Phoebe’s stories there’s Sal’s story. Sal’s goal is to take her Mom back home and bring her parents together again. Will Sal succeed? 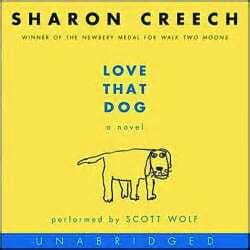 The author of Walk Two Moons is Sharon Creech. She won the Newberry Medal, Children’s book Rewards, Reading Association Award, Literaturhaus Award, and Young Adult Sequoyah Award for Walk Two Moons. She won the IRA/CBC Children’s Choices award in 1999 for The Bloomability. She won the Parents’ Choice Award for The Wanderer, it was a runner-up for the Newbery Medal, and it was also one of eight books on the Carnegie Medal shortlist. Love that Dog were a commanded runner-up for the 2001 Carnegie Medal. Sharon Creech won the 2002 Medal from the British librarians, recognizing Ruby Holler as the Year’s Best Children’s Book published in the U.K. Walk Two Moons is Sharon Creech’s best known book she has ever written. Walk Two Moons has 288 pages. I think this books recommended age is 10-16. The setting of this book is states of America. The first setting of this book is Bybanks, Kentucky which is Sal’s home. Then they moved to South Euclid, Ohio. I like this book because I understand it and it has a theme. I would rat this book as 4.5/5 star. Hate that Cat is about a student named Jack that hate cats. This book takes place at the bus stop, his classroom, and his house. One day when Jack was at his schools bus stop. He saw a fat black cat, he tried to help a fat black cat that’s on a tree. He thought that cat can’t get off the tree, so Jack grabbed his tail. Then the cat scratched him! That is why Jack hate cats. On Christmas Jack got a kitten, he was surprised. He loved that kitten. Jack named the kitten Skitter Mckitten. After some days Jack couldn’t find his cat. He was sad and stressed out. Then the fat black cat found Skitter, and brought it to Jack. Jack saw it. So he gave the fat black cat milk. At last, Jack liked cats! 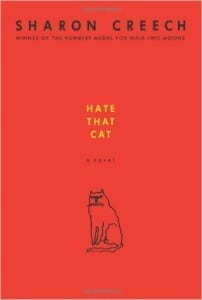 The author of Hate that Cat is Sharon Creech. She won the Newberry Medal, Children’s book Rewards, Reading Association Award, Literaturhaus Award, and Young Adult Sequoyah Award for Walk Two Moons. She won the IRA/CBC Children’s Choices award in 1999 for The Bloomability. She won the Parents’ Choice Award for The Wanderer, it was a runner-up for the Newbery Medal, and it was also one of eight books on the Carnegie Medal shortlist. Love that Dog were a commanded runner-up for the 2001 Carnegie Medal. Sharon Creech won the 2002 Medal from the British librarians, recognizing Ruby Holler as the Year’s Best Children’s Book published in the U.K. Hate that Cat has 176 pages, I think this books recommended age is 8-16. I don’t really like this book because I can’t find major themes and this book doesn’t have a beginning. This book is wrote in a poetry way. Hate that Cat is in the Jack Series. Love that Dog is in the same series, Love that Dog is the first book in the series and Hate that Cat is the second book. In the book Hate that Cat, Jack misses his dog Sky and that is why he like dogs better than cats. But at last he likes cat the same as dogs. I would rate this book 4/5 stars. Should Colleges Care about how Kind you are? Many high school students wants to get into a top university, to do this they need to have good grades and high test scores, but it can be stressful. There is a new report from Harvard University ( Harvard is one of the best universities from the world). The report says they are concerned about teenagers and teenagers might have been too stressed out about getting good grades. Besides good grades, other things matter. It’s important to be a good people and good people helps other students get into top universities. Students have mixed feelings about the report. Some people say they are too stressed out about getting good grades, they agree being a good person is important, but how can the universities tell if the student is a good person. Over 50 universities in USA praised the report, many others praised it, too. They all agreed with what they said, but other people were not convinced. Theres a website that helps students get into universities, but some students don’t. The website doesn’t like the universities choose students because asking students to be good will not solve the problem. Some high schoolers feel differently. They want universities to see that they are good people. Universities begun to change. Many schools no longer ask for test scores, they let students write something about themselves. They think that can show something about a student that a score cannot. I agree with newest way because tests can make students feel stressful, so writing about themselves can make them lest stressful and the university can know the student better. I chose this article because I like reading about school news, it’s very interesting. I think colleges should care about how kind you are. Barack Obama said school should take fewer tests. In October, he promised to come up with a plan. On Tuseday the Education Department sent out a letter, it gave the states an idea to limit testing. The letter said that schools can spend government money on it. States and districts get money to create tests, so the States can spend money to make tests better. 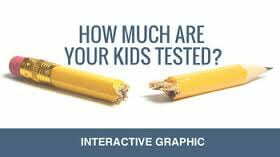 They can check if they have bad tests. These can be dropped, the letter said. The letter gave other ideas to the States. For example the States could lower the time students spend on taking tests. John King Jr. is in charge of the government’s Education Department, he said good tests are important, tests give useful information. They show how students are learning. They also show if the students can solve problems. These skills are important for their future. But students spend too many time on the test. They need to spend more time learning, the letter said. Council of the Great City Schools is a group of large city school districts. 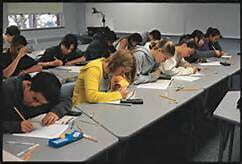 Students spend 20 to 25 hours each year on testing, the group said. From prekindergarten to 12th grade, students take about 112 tests. Today Mrs. Linda Ragsdale visited ISB. She talked about being a peacemaker and the company she’s working in. She’s working in Peace Dragons, Peace Dragons is company that makes peace. She has 3 kids. She write books about peace. She’s a cancer surviver. She said when your angry your heart turns upside down, so be a peacemaker. She gave us a Peace Drangons hand band. Mrs. Linda Ragsdale gave 4RB a task, the task is to be a peacemaker. How would you feel if people always spelled your name wrong, would you feel mad? Well, that is how Colombia feel because people always spell Colombia “Columbia”. 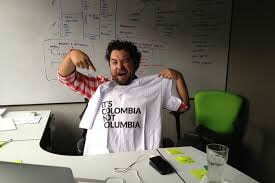 Three years ago, two Colombians had an idea to sell hats and T-shirts that say “IT’S COLOMBIA NOT COLUMBIA“. 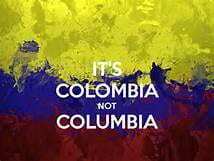 But people still spell Colombia incorrectly! Singer Justin Bieber, the coffee maker Starbucks, and even Richard Nixton, one of the presidents of U.S.A spelled Colombia incorrectly. It’s easy to see why English speakers spell Colombia incorrectly. Colombia is named after explorer Cristoforo Colombo. In English we write his name as Christopher Columbus. In Spanish his name is translated as Cristobal Colon. We spell his with an “u” instead of an “o“. Should the misspelling of Colombia make Colombians angry? Some people think so. Alejandro Giraldo think they shouldn’t get angry at others because of misspelling Colombia. Combo and Pardo(they made the hats and the T-shirts)think Colombians should because its not about the spelling it’s about how others around the world see Colombia. Some people think bad things about Colombia because there used to be many problems in Colombia. Things have gotten better. When Pombo sees Colombia misspelled, he corrects the mistake. He tells people about the good things happening in Colombia. Be positive!!! I chose this article because it’s interesting about how other people misspell Colombia. I think this article is good because it is positive. Everyone should spell Colombia correctly because it humiliates Colombia if you don’t spell Colombia correctly. 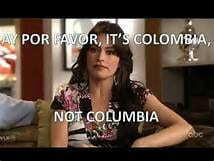 I think Pardo and Pombo is right because we should respect Colombia by spelling Colombia correctly.